It is absolutely no secret that Marshall is a brand known for their legendary tube guitar amps. However, their solid state and modeling offer, as less favorable as it is, actually keeps up in terms of quality and performance. One of the better examples of what we mean comes in form of Marshall Code 50W. If you are looking for a good combo for less than $300, this is one of the best ones you can grab at the moment. Let’s take a deeper look. One quick glance at the control panel of this giant cube will reveal that this is definitely not your regular Marshall unit. For starters, the controls are located on the top of the amp instead of the front, where we would usually find them. Control panel itself is divided into two portions. The lower one is where you knobs are. You have your gain, bass, mid and treble as well as your volume knob. However, above these, you will see a whole number or buttons. These are what you use to access and control the vast variety of effects, presets and cab emulations Code 50W has to offer. It is fair to say that figuring everything out will take some time. The overall design of Code 50W is very minimalist. The entire cab is one large cube that is completely black aside from the control panel and the Marshall logo in front. As its name states, this bad boy is capable of delivering some 50 Watts of power on demand. It does so through a single 12 Inch speaker, which is partially why this thing is so big. When it comes to presets, effects and similar, you have a lot to choose from. To be more specific, there are 14 preamp models, 4 power amp models and 8 speaker cab model presets available. On top of that, you get some 24 effects. Marshall Code 50W, being a true modeling amp, allows you to store presets, use cab emulation via headphones line out and more. One thing that is a constant for every Marshall amp is the performance. Even though it is not one of those classic tube rigs from this legendary brand, Code 50W packs one mean punch that brings all the colors we attribute to Marshall. Naturally, they have modeled in a number of their most popular amps and cabs, making this a perfect practice amp for fans of Marshall. In terms of application, you are looking at home use as well as gigging. With those 50 Watts of juice being pushed through a 12 Inch speaker, there is more than enough potential in this thing to saturate a smaller venue at a decent volume. At the end of the day, Marshall Code 50W is a very well priced amp that brings a great balance of versatility and performance. Suitable for both practice and gigging, it is the type of rig that can easily support a performing musician. The best thing of all is, of course, its tone. You may not get Marshall’s tube sound. but you definitely get the essence of their tone. For more info about the Marshall Code 50W Review , click here. 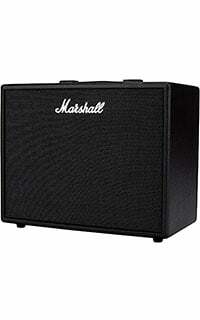 For more Best Guitar Amplifiers Under $300, click here. I purchased a Marshall Code 50 Combo amp a couple weeks ago. I have nothing but praise for this versatile amp with all the extras. I just played a solo gig last Friday and realized the power that this 1×12 combo has. I had to keep the levels down to a HALF! Yes a half! The effects, the computer aspect ability, the depth of sounds, etc all of it is beyond my expectations. Props to the crew for making a “practice” amp so powerful! I love you guys/gals and am now hooked on Marshall amps.